The Average True Range (ATR) was initially developed for commodity traders to measure market volatility, but traders of other instruments have added ATR to charts to determine volatility as well as to identify possible trend tops and bottoms. The standard ATR setting is 14, so it calculates the average of the true range over the past 14 periods. 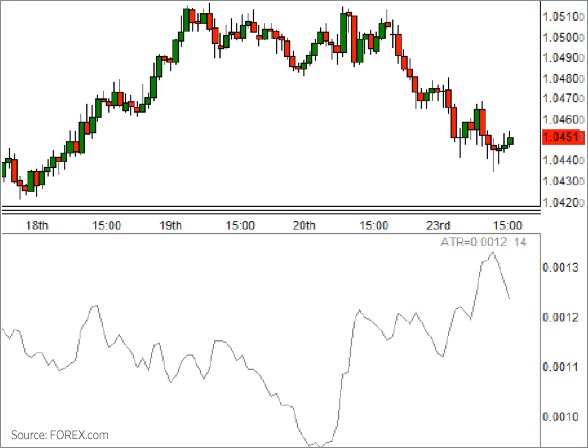 Like ADX, the ATR creates the single line that appears in the sub-graph below the chart. A low ATR shows that the price for the market is level and that there is little to no volatility in the market. A high ATR indicates that the markets are volatile. 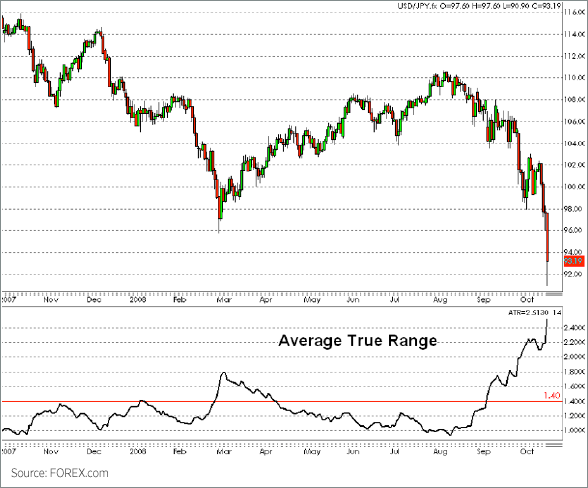 In the USD/JPY chart, you can see that over the past 12 months, the ATR has rarely gone over 1.40 or 140 pips. However in September, not only did the ATR break above that level, but it reached as high as 250 pips. This indicates that the average trading range for the currency pair has neary doubled.